Cabot Guns, the renowned custom 1911 maker, has shown another work of art from their OAK Collection of 1911 pistols. 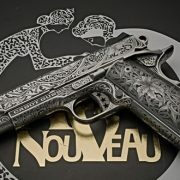 This richly engraved gun is called Le Nouveau after the style of art, Art Nouveau, which motifs are used in the engraving pattern. The OAK Collection of Cabot pistols includes the company’s top grade one-of-a-kind guns. These […] Read More … The post Cabot OAK Custom “Le Nouveau” 1911 Pistol appeared first on The Firearm Blog. 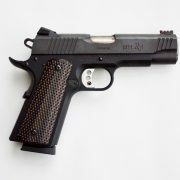 The model of 1911 pistol is an American classic and has a long and illustrious history. While we can’t possibly cover everything about the 1911, today we’re going to look at some of the high points in the love affair that America has enjoyed with this iconic pistol. We make every effort to ensure technical […] Read More … The post American Icon: A Brief History Of The 1911 Pistol appeared first on The Firearm Blog. Welcome everyone to the fifth edition of “Hot Gat or Fudd Crap?”, one of our many series here on TFB. If you missed any one of our other articles, this is where we look at the most obscure firearms that are actually for sale and ask the question – is this a sweet deal or […] Read More … The post HOT GAT or FUDD CRAP? 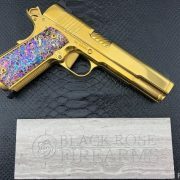 Gilded 1911 Looks Like Mardi Gras But Feels Like April Fool’s appeared first on The Firearm Blog. Nighthawk Custom’s slogan is “One Gun, One Gunsmith,” which they claim is the direct result of how they build their guns. The company was founded in 2004 by a group of four individuals with a passion for the 1911 platform. 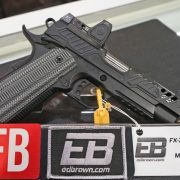 They have now expanded into approximately 65 full-time employees, and their selection and assortment of […] Read More … The post VIP BLACK Pistol from Nighthawk Custom – with Gold Bead front sight appeared first on The Firearm Blog. 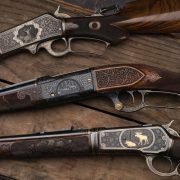 Today I am introducing to our readers another installment from our series of articles about most expensive firearms sold in the major US auction houses. Last month, we discussed some of the most interesting, rare and unique lots consigned to the Rock Island December 2018 Premiere Firearms Auction. In this article, we’ll take a look at the five […] Read More … The post Top 5 Most Expensive Guns Sold in Rock Island December 2018 Premiere Firearms Auction appeared first on The Firearm Blog. 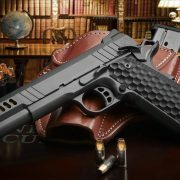 Wilson Combat has just released this beautiful work of art – the Supergrade Commander Special. 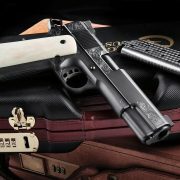 This is the first commander size classic style handgun added to the Supergrade family of deluxe Wilson Combat 1911 pistols. Let’s first watch the promo video then go through the specs of this gun. 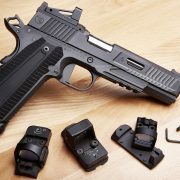 The Wilson Combat Supergrade Commander Special pistol comes […] Read More … The post Wilson Combat Supergrade Commander Special appeared first on The Firearm Blog. 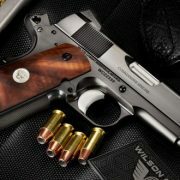 When I first got back into guns as an adult, the range I would visit in the Bay Area had a Wilson Combat 1911 for rent. So I rented one exactly once, and after shooting it and looking up the price-tag I vowed never to touch another 1911, lest the fever get its hooks into […] Read More … The post Review: Remington 1911 R1 Ultralight Commander appeared first on The Firearm Blog. 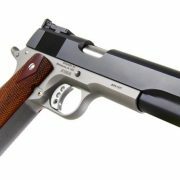 Nighthawk Custom has announced a new 1911 that is a part of their Boardroom Series that they began late last year. This newest addition is dubbed The President, and like the name infers, you have high-end quality poured over this model just like the position itself. This is only the second model that Nighthawk Custom […] Read More … The post Meet THE PRESIDENT in the Boardroom with Nighthawk Custom appeared first on The Firearm Blog. It might be quite a surprise to many of you that Savage Arms used to make pistols. This dates back to 1910, but it is true. What also may surprise you is their short stint in producing pistols almost dethroned John Moses Browning’s now legendary Model 1911! The first pistol Savage Arms ever made was […] Read More … The post POTD: Savage Arms’ M1907 Pistol that Almost DEFEATED the 1911 appeared first on The Firearm Blog. 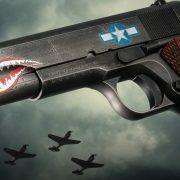 The 1911 is renowned for winning two world wars. At least that is the mantra die hard 1911 fans recite. And the Fulton Industries MX991/U anglehead flashlight has been utlized for decades since the Vietnam War. 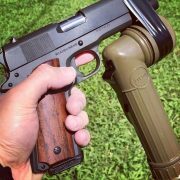 Well someone had the great idea to combine these military cornerstones into one complete weapons package, a pseudo 1911 […] Read More … The post POTD: DIY 1911 AOW Weapon Light appeared first on The Firearm Blog. 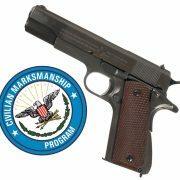 You can now order a surplus 1911 from the Civilian Marksmanship Program as the first batch of iconic pistols becomes available. Way back in November 2017, we reported that the Civilian Marksmanship Program (CMP) would be receiving up to 10,000 surplus 1911A1 pistols. Since then we have closely followed the CMP’s progress in bringing the guns […] Read More … The post Orders Open for CMP 1911s appeared first on The Firearm Blog. 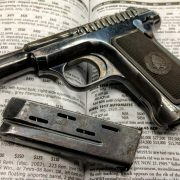 The Kahr Firearms Group includes Kahrs Arms, Auto Ordnance and Magnum Research and they have been introducing a lot of commemorative 1911 pistols as of late. Their newest additions are the “Squadron,” a case-hardened model, and the “Pledge.” All of these boast a ton of curb appeal and Kahr Firearms Group is banking on consumers […] Read More … The post Kahr Firearms Group releases Squadron, Case-Hardened & Pledge 1911 Pistols appeared first on The Firearm Blog.